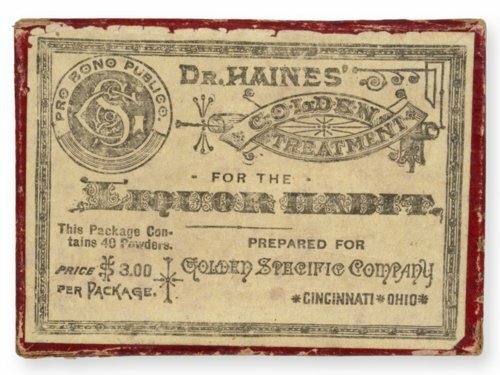 Yellow cardboard package labeled "Dr. Haines Golden Treatment for the Liquor Habit." James Wilkins Haines was a Quaker minister, homeopathic physician, and alleged practitioner of quack medicine. Operating in Cincinnati, Ohio, in the late 19th century, Haines promoted a popular false theory that ingesting bichloride of gold cured alcoholism. Advertised as the Golden Treatment, the tablets contained benign substances and trace amounts of ipecac. Medicinal cures for alcoholism were popular during the Temperance movement.